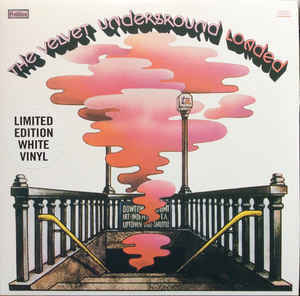 THE VELVET UNDERGROUND-LOADED-LIMITED VINYL EDITION. With the continued resurgence in interest of all things vinyl, many retailers and record companies are joining forces to release limited edition of what they refer to as classic albums. That description is stretching things for some of the albums that have been conferred classic status. Indeed, sometimes, the word classic is something more than a marketing term. Not in the case of The Velvet Underground’s fourth album Loaded. It’s been remastered and reissued on heavyweight white vinyl, and retailed via HMV as part of their Vinyl Week. Only 1,000 copies of Loaded were pressed, and quickly, this pressing is becoming a collectable. So if you see a copy, don’t hesitate, and add it to your collection. After all, Loaded was an important album for The Velvet Underground. For The Velvet Underground, 1969 had been a turbulent year. They had released their third album The Velvet Underground in March 1969. It featured the debut of Doug Yule, who was brought in to replace John Cale. This was meant to the start of a bright new future for The Velvet Underground. After two albums which had failed commercially, Lou Reed decided that The Velvet Underground had to change tack. They had to release music that was much more pop oriented and therefore, commercial. John Cale however, didn’t agree with how Lou Reed’s master-plan. This had been a bone of contention between the pair for some time. John Cale wanted The Velvet Underground to continue to innovate, and create experimental music like White Light/White Heat, The Velvet Underground’s sophomore album. Lou Reed didn’t agree. Lou Reed believed that The Velvet Underground’s music should become more pop oriented. This he felt, would broaden their appeal. No longer would they be an art rock group whose music appealed to discerning music lovers. Eventually, Lou Reed won over the rest of The Velvet Underground. For John Cale this was hugely disappointing. So, he decided the only option was to leave The Velvet Underground. Following the departure of John Cale, The Velvet Underground began looking for a replacement. Eventually, Doug Yule was chosen as John Cale’s replacement. He made his Velvet Underground eponymous third album in November 1968, at TTG Studios, Hollywood. The Velvet Underground recorded ten songs penned by Lou Reed. By December 1968, The Velvet Underground was completed it was released in March 1969. Before that, critics had their say on The Velvet Underground. The majority of the critics were won over by The Velvet Underground’s new sound. Some critics went as far as to say that the album was The Velvet Underground’s finest hour. They were impressed The Velvet Underground’s much more accessible sound. The Velvet Underground were congratulated on the quality of songwriting, and the delivery of the lyrics. However, there was a but. Some critics felt that The Murder Mystery was an experiment that hadn’t worked. Others ant further, lamenting that The Murder Mystery fell short of the quality of White Light/White Heat. Other critics remarked that The Velvet Underground lacked the eclectic sound of its predecessors. Even the quality of recording was criticised. Mostly though, critics thought that The Velvet Underground were on the right road. However, as usual, record buyers had the casting vote. When The Velvet Underground was released in March 1969, the album crept into the US Billboard 200, reaching just 197. This was a disaster for The Velvet Underground. Lou Reed’s decision to embrace a more commercial sound had backfired. Following the release of The Velvet Underground, the band headed out on tour. They spent much of 1969 touring America and Canada. Night after night, they reworked tracks from their first three albums. The audience watched as a tight band fought for their very future. Some nights, The Velvet Underground debuted new songs. New Age, Rock and Roll and Sweet Jane found their way onto the set list. This trio of songs found their way onto Loaded, which was released in 1970. Loaded has been reissued by Rhino, to mark the forty-fifth anniversary of Loaded’s release. It proved a landmark album in The Velvet Underground’s career. As The Velvet Underground’s seemingly never ending tour continued, they continued to hone their sound. They were a very different band to just a few years previously when they were Warholian disciples. That was the past. Now The Velvet Underground were willing to forsake what many thought was their true sound, for commercial success. That proved ironic. After three albums that had failed commercially, MGM were starting to loose patience with The Velvet Underground. It didn’t help that MGM had been haemorrhaging money for a couple of years. They had too many loss making acts on their roster. Something had to give. During the night of the long knives, executives at MGM decided to cancel the contracts of eighteen loss making acts. This included The Velvet Underground. They were invited to the headquarters of MGM, and told that their contract had been cancelled. However, was the decision to cut The Velvet Underground loose purely a business decision? Since then, there has been speculation that The Velvet Underground were dropped just because they were losing MGM money. Maybe, it was more to do with The Velvet Underground’s image being at odds with MGM’s corporate image? That proved to be the case. In 1970, an executive of MGM said: “it wasn’t eighteen groups, Mike Curb was misquoted. The cuts were made partly to do with the drug scene—like maybe a third of them had to do with drug reasons. The others were dropped because they weren’t selling.” It seemed that MGM’s mattered more than selling records. MGM it seemed, only wanted artists whose lifestyle they approved of. Many thought that being dropped by MGM must have been devastating for The Velvet Underground. It seems it was, and it wasn’t. When Lou Reed was interviewed in 1987, he admitted: “we wanted to get out of there.” That may just be bravado. After all, the music industry is a small village, and word would’ve spread like wildfire why The Velvet Underground had been dropped. Some critics however, thought the situation was ironic. Back in 1968, The Velvet Underground had made what many regarded as the ultimate musical sacrifice. They had changed direction musically on their eponymous third album. No longer were they seen as an art rock band by championed by many critics and cultural commentators. Instead, the move towards a more populist sound was seen as the ultimate betrayal from The Velvet Underground. This resulted in John Cale’s departure from the band. Now that The Velvet Underground had been dropped by MGM, the loss of one of their main creative forces, had been for nothing. Given what had happened, it was the ultimate irony. Now without a record contract, The Velvet Underground headed back out on tour. Touring was now their main source of income. So they spent much of 1969 on the road. Mostly, it was the tight version of The Velvet Underground that took to the stage. Other times, they revisited their past. The Velvet Underground decided to reinvent songs, during lengthy improvisations. This mixture of art rock, avant garde and free jazz showed that the old Velvet Underground weren’t dead. Some critics believed it was merely being suppressed in the search for commercial success. During their gruelling touring schedule, The Velvet Underground made occasional forays into the recording studio. Some of the songs The Velvet Underground recorded, were seen as having potential. However, they couldn’t be released, as The Velvet Underground were in dispute with MGM. With no recording contract, and locked in what could prove a biter, lengthy and expensive dispute with MGM, things looked bleak for The Velvet Underground. By November 1969, The Velvet Underground arrived in San Francisco, and were due to play at The Matrix and The Family Dog. These shows were recorded, and were meant to be released as live albums. However, that didn’t happen until the next millennia, when Bootleg Series Volume 1: The Quine Tapes was released in 2001. 1969 was fast proving to by The Velvet Underground’s Annus horriblis. Surely, things would improve as when the new decade dawned. That proved to be the case. 1970 saw The Velvet Underground’s luck improve. They were signed by Atlantic Records, and told to record an album: “loaded with hits.” This would be a first. With these words ringing in his ears, Lou Reed went away and wrote the ten tracks that became Loaded. Then recording began at Atlantic Recording Studios, New York with Geoff Haslam, Shel Kagan and The Velvet Underground producing Loaded. However, one member of The Velvet Underground was missing. Maureen Tucker missed the Loaded recording sessions. They took place between April and August 1970. Her only contribution was singing on the outtake I’m Sticking With You, and adding drums on a demo of I Found a Reason. Loaded was the first Velvet Underground album Maureen Tucker.was missing from. Various musicians replaced Maureen Tucker on Loaded. Engineer Adrian Barber, who played on Who Loves the Sun and Sweet Jane. Tommy Castagnaro then played drums on Cool It Down” and Head Held High. Billy Yule, Doug Yule’s brother deputised on drums on Lonesome Cowboy Bill and Oh! Sweet Nuthin.’ Even bassist Doug Yule played drums. Although hired as a bassist, Doug Yule played fuzz bass, piano, keyboards, lead guitar, percussion and added backing vocals. He added the lead vocals on Who Loves the Sun, New Age, Lonesome Cowboy Bill and Oh! Sweet Nuthin’. Sterling Morrison played lead and rhythm guitar. Lou Reed, who was now The Velvet Underground’s main creative and driving force, played lead and rhythm guitar, plus the piano. This depleted version of The Velvet Underground, plus a few friends eventually, finished recording of Loaded in August 1968. The release was scheduled for 15th November 1970. A lot would happen before then. With Loaded completed, usually, The Velvet Underground would’ve been readying themselves for the usual round of promotion that takes place before an album is released. Not this time. Lou Reed called time on his career with The Velvet Underground on 23rd August 1970. This left The Velvet Underground like a rudderless ship. With The Velvet Underground having lost their leader and creative force, others took charge of final mix of the album. That was fatal. Lou Reed should’ve handed Atlantic Records the final mix, and then left. When Lou Reed saw and heard a copy of Loaded, he was in for a shock. The claimed that Loaded had been re-sequenced. This hadn’t been authorised. That was bad enough. No longer would Loaded flow as it was meant to. Much worse, was that some of Lou Reed alleged that some of the songs on Loaded had been edited. Lou Reed railed against the edited version of Mary Jane. So badly edited was the song, that it was bereft of its very melody. A heartbroken Lou Reed described the melody as: “heavenly wine and roses.” Sadly, it was gone. New Age was another song that had fallen victim to the razor blade in the editing suite. However, one of the remaining members of The Velvet Underground disputed Lou Reed’s claims. It was newcomer Doug Yule who spoke out. Despite being a relative newcomer to the band, he disputed what Lou Reed said. Doug Yule claimed that it was Lou Reed who edited Mary Jane, before he left The Velvet Underground. This essence of his explanation was that Lou Reed edited the song so that it would be a hit. However, it was claim and counter-claim. If Lou Reed edited the song, why did he edit the “heavenly wine and roses” of the melody from the song? The editing was just one of several grievances Lou Reed had. The ten songs on Loaded came from the pen of Lou Reed. However, when Lou Reed received his copy of Loaded, he discovered that the songs were credited to The Velvet Underground. What made this worse, was that Lou Reed was third in the credits. He felt he wasn’t receiving the credit he deserved. Rubbing salt into the wound was a large photograph of Doug Yule playing the piano. The Velvet Underground’s creative force was overshadowed by the newcomer. Was this a deliberate slight seen Lou Reed had left The Velvet Underground? As Lou Reed studied Loaded album’s cover, he discovered that Maureen Tucker was credited as the drummer. She hadn’t played on Loaded, as she was pregnant. It was the only Velvet Underground she didn’t play on. Ironically, many critics felt Loaded was one The Velvet Underground’s finest albums. However, even another member of the band didn’t agree with this. Sterling Morrison had been ever-present on the four albums The Velvet Underground had released. This made him well qualified to critique the album. He had mixed feelings on the absence of Maureen Tucker and Doug Yule’s increased influence on Loaded. Without Maureen Tucker: “it’s still called a Velvet Underground record. But what it really is is something else.” Then when asked about Doug Yule playing a bigger part on Loaded he said: ”the album came out okay, as far as production it’s the best, but it would have been better if it had real good Lou vocals on all the tracks.” It seems the newcomer hadn’t convinced The Velvet Underground guitarist. What did the critics think? Most critics were won over by Loaded. It followed in the footsteps of The Velvet Underground, which showcased a much more populist, commercial sound. Among Loaded’s highlights were the hook-laden, Sweet Jane and Rock and Roll. Even without the “heavenly wine and roses” of the melody, Sweet Jane was a timeless classic. Along with Rock and Roll, they became favourites on American FM radio stations. Other tracks that were mentioned in dispatches by critics were the soulful infused I Found a Reason and New Age. However, not everyone was convinced by Loaded. Rolling Stone magazine wasn’t impressed by Loaded. They were the highest profile critic of Loaded. Ironically, they’ve performed a volte face, and nowadays, Loaded is one Rolling Stone magazine’s 500 best albums of all time. However, Rolling Stone weren’t being contrarian, like some critics. While Loaded is indeed, a minor classic, it could’ve and would’ve been a better album. Especially, if Lou Reed took charge of all the lead vocals. Sterling Morrison had a point. Lou Reed was The Velvet Underground’s best vocalist. Having written the lyrics, he was able to bring them to life. From Sweet Jane and Rock and Roll, to Cool It Down, Head Held High, I Found A Reason and Train Round The Bend, Lou Reed unleashes a series of vocal masterclasses. Sadly, he only sung six of the ten vocals. That proved to be a a mistake. In another group, Doug Yule would’ve been a more than adequate replacement. However, he couldn’t quite live the lyrics like Lou Reed. That’s not to say his performance is disappointing on on Who Loves the Sun, New Age, Lonesome Cowboy Bill and “Oh! Sweet Nuthin’. Far from it. Instead, they’re just not as good as The Velvet Underground’s worldweary leader, Lou Reed. Those were big shoes to fill. Even Sterling Morrison agreed. Similarly, Maureen Turner was missed. While her replacements are more than adequate, it could be argued that there’s no continuity. Each drummer has their own sound and style. Despite that, Loaded came to be regarded as a minor classic. Very few people thought that would be the case in 1970. When Loaded was released on 15th November 1970, the album failed to chart. It stopped just short, reaching 202 in the US Billboard 200. So near, but yet so far. This was a familiar story for The Velvet Underground. Their fourth album Loaded deserved to fare better. They had sacrificed and suppressed their true sound to deliver an “album loaded with hits.” Loaded had everything going for it. It benefited from a much more commercial sound, and plethora of hooks. This meant that Loaded was The Velvet Underground’s most accessible album. Surely this was what record buyers wanted The Velvet Underground reasoned? Record buyers had shied away from The Velvet Underground and Nico and White Light/White Heat. Then on The Velvet Underground, which was released in 1969, Lou Reed and Co. moved towards a more populist, accessible sound. This came at the cost of John Cale. Still The Velvet Underground failed commercially, and MGM dropped the Velvets. This proved the ultimate irony. Just under a year later, and Lou Reed was gone too. This left just Sterling Morrison and the returning Maureen Tucker. Sadly, The Velvet Underground were a shadow of the band they once were. Loaded proved to be what many regard as their swan-song. Despite its flaws, Loaded is a minor classic from The Velvet Underground. Nowadays, it’s regarded as one of the best 500 albums by Rolling Stone magazine. Loaded also belongs in every self-respected record collection. For those who have yet to discover Loaded, now is the time to do so. Loaded was recent remastered and reissued on 180 gram white vinyl, and has been retailed via HMV as part of their Vinyl Week. This new version of Loaded has been beautifully mastered and the sound quality is pretty near flawless. That’s fitting for this classic album. Sadly, all too often, the sound quality of vinyl reissues can be disappointing, for a myriad of reasons. Not this time. For anyone new to vinyl and The Velvet Underground, then this version of Loaded is the one to buy. It even comes complete with a download code. Alas, that’s something many record companies overlook. Not this time. The reissue of Loaded is a reminder that this was the end of an era for one of rock’s most innovative bands, The Velvet Underground. Never again would Lou Reed join with Maureen Tucker, Sterling Morrison and Doug Yale again as The Velvet Underground. Squeeze which was released in 1972, was a Velvet Underground in name only. Only Doug Yule, who was using The Velvet Underground name featured on Squeeze. It’s not worthy of bearing The Velvet Underground name. That why for many, Loaded marked the end of The Velvet Underground story. Their recording career had started in 1967 with The Velvet Underground and Nico, 1968s White Light/White Heat, 1969s The Velvet Underground and Loaded in 1970. Nowadays, each and every one of these albums are regarded as a classic; and The Velvet Underground are remembered as one of the most important, influential and innovative bands in the history of music. However, one can’t help wonder what direction The Velvet Underground would’ve headed if they hadn’t changed direction musically? The Velvet Underground and Loaded would be very different albums. However, maybe, The Velvet Underground had no option. MGM were losing money hand over fist. They needed bands to sell vast quantities of albums, not release albums that would find favour with discerning music lovers. Maybe, if The Velvet Underground had known they were going to be dropped, they would’ve stuck to their musical principles? That wasn’t to be. Instead, The Velvet Underground sacrificed their musical soul at the altar of populist music. John Cale couldn’t bear to watch this sacrifice, and walked away with his principles intact. Lou Reed desperate for the band he formed find commercial success as well as critical acclaim, played the game. After two albums of The Velvet Underground suppressing what they stood for musically, Lou Reed walked away. He left behind one of the richest legacies for any group who only recorded four studio albums. Each is a classic. From The Velvet Underground and Nico to Loaded, each album features shamanistic performances from those musical shape shifters and high priests of music, The Velvet Underground. ← HEDVIG MOLLESTAD TRIO-BLACK STABAT MATER.